The evening star pattern is a bearish trend reversal sign. It appears on the top of an uptrend and has three elements. On the first day a long white candlestick forms, showing a strong buying disposition. On the consecutive day the trend is still growing but the candlestick is much smaller, indicating indecision. The colour of this candle can be both black and white. Day three brings the change when it gaps down. The stock price is pressed even further downward and a long black candle appears. This should open at or lower than the highest level of the body of the second candlestick, and it should close well into the white candlestick that forms on the first day. This third candle in the pattern is used as a confirmation point. 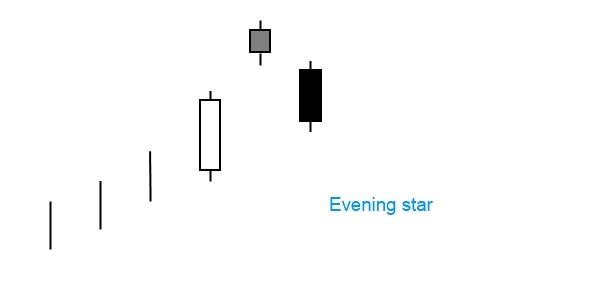 The evening star is the relative of the evening doji star and the inverse of morning star pattern.